Accidents Happen, So Keep a Pet Odour Eliminator Handy! We’ve all been known to have a little accident from time to time. Whether it’s wetting the bed as a child or bringing up the suspicious kebab you had last night, it happens! However, they are not just limited to humans – our beloved pets have accidents all the time. From going for a pee on your favourite settee, to having a pup that won’t stop throwing up. When they occur, they give off very unpleasant odours which soon become a real uphill battle to get rid of. It’s simple really, just use Pet Fresh. Pet Fresh is an all-natural pet odour eliminator using beneficial bacteria and enzymes to break it down and digest it. It also leaves behind a fresh, spring mint fragrance. Pet Fresh tackles the source of the bad odour and eliminates it rather than just covering it up like some other deodoriser or baking soda. The specific bacteria used works on all pet accidents to eliminate odours, whilst being safe around pets and children. The chemical free solution ensures that it can be used safely on all water safe surfaces without discolouring or staining. From carpets and clothing, to vinyl and wood, wherever your pet decides to do their business next, you’re covered. As if eliminating odours wasn’t impressive enough, the bacteria used will also deter your pets from having accidents again. Every hour, someone in the UK starts to lose their sight. That’s why Envii can guarantee that £1 from the sale of every bottle of Pet Fresh will go directly to the Guide Dogs charity. Guide Dogs relies on donations from the public to keep their life-changing services running. Demand for their guide dog service has grown by over 25% in the last 7 years. Replace your usual floor cleaner with 50ml of Pet Fresh Concentrate to protect against new urine smells appearing. Is it safe to use on all surfaces? Yes, Pet Fresh can be used on all hard and soft surfaces but we would recommend testing on a small area first. Can this be used as a deterrent? It will act as a mild deterrent when used regularly but pets could decide to just use another spot. What does the product smell of? Pet Fresh has a sprint mint fragrance. 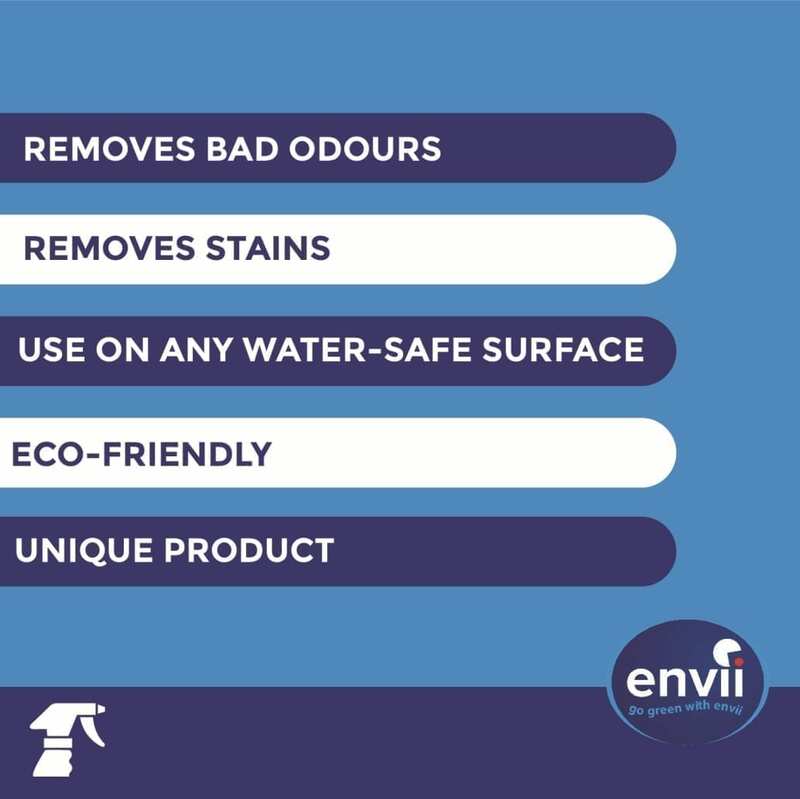 Natural odour eliminator that uses beneficial bacteria to remove sweat odours and stains from all clothing and footwear. The beneficial bacteria target the source of the odour (rather than just masking it) and leave behind a fresh, mint fragrance.